It may be a new year but we've still got a Recipe Box full of mystery dishes and there's bound to be some disasters in there... so it should come as no surprise that I already found one, on only the second week of the year. The thing that DID come as a surprise to me is that this disaster is an apple tart recipe. In the history of my baking life (admittedly not an illustrious history, but a history nonetheless) I have neither baked nor tasted an apple dessert I do not like. Don't get me wrong, I'm not an apple fanatic- I'd choose Anything With Frosting or Most Things with Chocolate over an apple dessert most days- but the great thing about apple desserts is how reliable they are. They're always tasty, they're always cosy and they make your house smell amazing when you bake them; you can reliably make one anytime of year without waiting for the fruit to be in season; they often work just as well for a luxurious breakfast as they do for a dinner-party worthy dessert; many taste as delicious warm from the oven as they do at room temperature; most people like them and I've never met anyone allergic to them to date. All that said, I finally found an apple dessert that is just not worth it. I made this one recent frosty morning when outside was so cold that the ice on the ground still hadn't melted from days before and I just wanted something warming in my kitchen. This kuchen was supposed to do the trick but it lied to us, dear reader. First of all, this cake requires that you make a dough (yes, a dough, not a batter) and then line a springform pan with it. This should have been hint #1 that things would quickly go south, but I thought I was experienced enough to handle a freeform tart so I went ahead with it. The dough is then pressed into the bottom of the springform and up the sides of it, but there wasn't nearly enough dough so it was almost impossible to get the dough more than ½-inch or so up the sides without making bald spots on the bottom of the pan. Once that's done, you fill the middle with a cooked-apple mixture you've already made, and which is so full of juice that the pan is basically just a bowl of liquid. Then you bake it, praying the whole time that it doesn't leak hot caramelised apple liquid onto the bottom of your oven (for once, it didn't!) and when it's done, you try to saw through it with every serrated knife you own. The cake portion of this cooked up thin and crunchy, but, like, not in a good way. The texture was cardboard-y and flavourless, except for the filling. The really unfortunate part about this kuchen is that the filling is actually delicious... so delicious that we may or may not have scooped the apple-cherry filling out and stirred it into a bowl of porridge for breakfast on the morning after I made this ill-fated recipe... and again every day until we ran out of filling. As always, despite the fact that it's a disaster, I'm including the full recipe. Don't make this cake, but if you're in the mood for the best porridge of your life, make this filling. It works on pancakes, in porridge, in yoghurt and also probably in ice cream, but I didn't get around to testing that for sure before I ran out of filling. If you're on the hunt for a better apple recipe, check out the others (all better than this!) over here. 2 spoons out of five. I can't give it any less because of how good that filling was, man. 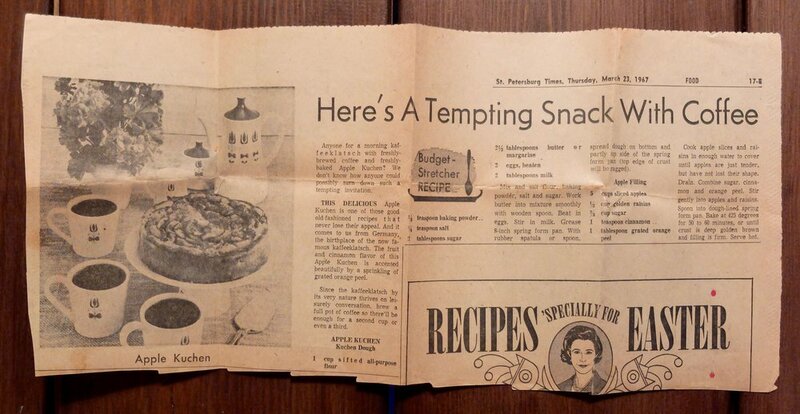 After making a Load of newspaper recipes from this box, it's a little embarrassing how fast i was able to identify the woman on the bottom right as Betty crocker. Simmer apple slices and raisins or cherries in just enough water to cover them until apples are just tender but still retain their shape (about 10 minutes). Meanwhile, combine sugar, cinnamon and orange zest. Drain fruit, then stir sugar mixture into fruit. This will immediately make a syrup, but that's ok.
Preheat oven to 210C/425F and grease an 8-inch springform pan. Work in butter by mixing at low speed. Beat in eggs, then stir in milk JUST until combined. Spread dough on bottom and up sides of prepared springform pan. Pour fruit mixture into pan along with any syrup that has formed. Bake 45-50 minutes, until crust is deep golden and filling is firm-ish and bubbly.